Our immune system is composed of organs, tissues, cells, and chemical messengers that interact to protect the body from external invaders and its own internally altered cells (this alteration could be in its DNA code called as genotype or the function of the cell called as phenotype. The best way to understand this system is through the body’s various levels of defense. 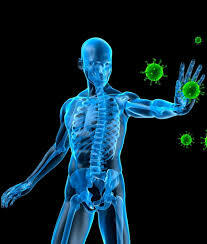 There are two types of immunities in the human body SPECIFIC and the OTHER NON_SPECIFIC. NON-SPECIFIC I would like to cover first and this form of body immunity has two mechanisms about how it works. These two mechanisms are first line of defense and the second line of defense. Mechanical—Examples include the skin, which acts as a barrier, and the sticky mucus on mucous membranes, which serves to trap pathogens. Physical—Examples include coughing, sneezing, vomiting, and diarrhea. Although not pleasant, these serve to expel pathogens that have gotten past the initial barriers. Chemical—Examples include tears, saliva, and perspiration. These have a slightly acidic nature that deters pathogens from entering the body while also washing them away. In addition, stomach acids and enzymes serve to kill germs. Phagocytosis (fag oh sye TOH sis)—Phagocytosis is the process of cells “eating” and destroying microorganisms. ( for detailed reading these are Pathogens that make it past the first line of defense and enter into the bloodstream may be consumed by neutro- phils and monocytes). Please note that soon after the chemotherapy patients often suffer neutropenia that is showing up as the cells are being killed, normal and also CANCERous cells and this is one of the side affects of chemotherapy. Hence these patients are told not to have cut fruits, long cut and kept salads and juices that may have foreign bodies who this cancer survivor may not be able to through his own immunity. Inflammation—Acquiring its name from its properties, inflammation is a protective response to irritation or injury. The characteristics (heat, swelling, redness, and pain) arise in response. If caused by a pathogen, the inflammation is called an “infection”. Pyrexia (pye RECK see uh)—Pyrexia is the medical term for fever. When infection is present, fever may serve a protective function which tries to defuse the function of the pathogens. NON SPECIFIC immunity can be acquired or natural. Has four mechanisms about how it works and the nonspecific immunity has four. Specific immunity comes to us genetic make up or us through up (to understand this simpler though not accurate this comes to us in the form our parents had) or from the ability of Immunoglobulin in our body that make opposite soldiers to kill the bodies that enter inside the human body. These manufactured small bodies are called as antibodies and in case we cannot make them we need to take antibiotics. Antibiotics are of many times that target specific foreign bodies. I am not going much in detail on the acquired or artificial SPECIFIC Immunity, but you may note that a person can artificially acquire these by having vaccinations of types. Other type of acquired SPECIFIC immunity is given to patients and also to some cancer patients use of immunoglobulins from a donor who have developed are understood to have acquired immunity that is stronger and can help the patients. I could pick from a web site that explains this better for a normal person than I thought I could as a doctor and it states Cancer immunology is a branch of immunology that studies interactions between the immune system and cancer cells (also called tumors or malignancies). Various strains of Human Papilloma Virus (HPV) have recently been found to play an important role in the development of cervical cancer. Immunotherapy – The genetic profile of the tumor microenvironment and its potential correlation with anti-tumor immune responses has become an area of increased study in recent years. As it may get complicated I am leaving this here with advise to eat well and to keep your immune system alive and strong to fight not only cancers that are caused by viruses but also some head and neck cancers, besides TB. Wish it has been a simple read so far?? Happy and safe holidays to all. Previous Entry:Mistrust vs. Distrust are they the same? ?